Last Christmas I was transported to Wynthorpe Hall in Sleigh Rides and Silver Bells at The Christmas Fair. I was introduced to Angus and Catherine, owners of the hall. Jamie, Archie and Christopher are their sons. The Hall is a magnet for gathering waifs and strays into their family fold which is how Anna was introduced in the first novel But we also have the cook Dorothy; handyman Mike; local wise lady Molly and cleaner come general factotum Hayley. So that is the setting, the place and the characters. This novel introduces another visitor to the Hall, Gabe who comes to help Jamie with his outdoor adventure scheme which he has started to help children that have perhaps not had the best start in life. Gabe soon fits into the ways of the hall but his first meeting is when he literally bumps into Hayley as she goes to investigate where her fiance has disappeared to and who with on the night of their engagement party. The results are as you would expect and Gabe, ironically short for Gabriel is the angel that saves her. Hayley swears off all men and ever finding that one true honest love and goes back to her acerbic and strong-willed ways. Gabe seems to get under her skin though and just as she thinks perhaps life maybe different, he retreats. Every time it is further and until Hayley is forced to give up and her head is turned back to the past. In the meantime, building on the success of last years sleigh rides – Angus wants to open a Winter Wonderland and he needs everyone on board family or otherwise for it to work. Hayley and Gabe are push together again but it seems that Hayley’s talents might lie elsewhere. Will the Winter Wonderland work? And will Hayley and Gabe sort out whatever it is they keep falling out over? You can read this as a stand alone novel, but to be honest if you want to get a complete feel for the setting, the characters, and of course Christmas then I highly recommend going back and reading Sleigh Rides and Silver Bells. An excellent Christmas read and if your Christmas is normally wet, grey and miserable this is a sure-fire way of immersing yourself in a Christmas that can exist! 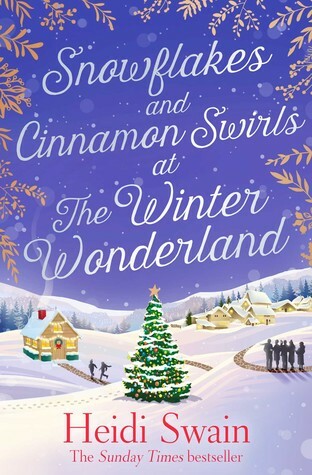 Snowflakes and Cinnamon Swirls at the Winter Wonderland is published on 2 November 2018.